One of the benefits of a lifetime of afterlife communication is that I know a lot about ghosts … what they are and what they’re not. For instance, they’re not “caught between worlds.” And they don’t need us to help them “move on.” They’re exactly where they’re supposed to be. You don’t honestly think that God, the Creator of the Universe, would leave their eternal fate in your and my hands, do you? You CAN say that they are “earthbound,” but that’s because their consciousness never left the earth. And when you die, yours won’t either. We’re all right here together forever. That’s just the nature of the afterlife. Yes, knowing the laws of the afterlife can make these things a lot clearer. Lately, I’ve been researching what folks believe about ghosts and hauntings. I’ve investigated the investigations. Repeatedly I’ve read, “We don’t use ouija boards, séances, mediums or occult methods.” Yet it’s common for ghost researchers to accept, as an underlying condition of their investigations, the erroneous claims of psychics, mediums, and channels. I’m referring to such concepts as “caught between worlds,” “unfinished business,” “earthbound souls,” and ghost children in distress. At the same time, ominous warnings urge vigilant caution in case non-human demons and malevolent entities are encountered. Oh, and don’t forget the Hollywood expression, “Go to the light.” Scientific research can’t be conducted properly on a foundation of superstition. Let me tell you some things that are true about ghosts. Actually, there are only two kinds of ghosts: real and not real. The real ghosts are everywhere. They’re in your home, in your car, in your school, and in your dreams. Ghost researchers call these interactive ghosts. I call them soul-ghosts or disincarnate souls. I don’t care for the term, disembodied because they do have a body. We just can’t see it for the same reason that we can’t see sound waves and ultraviolet light. They’re outside the range of our sentient boundary. Soul-ghosts are interactive. They reach out to you, and you feel no fear … absolutely none. They envelop you in a blanket of warm fuzzies. Real ghosts can be mistaken for angels. This isn’t a paranormal experience. It’s a supernatural and spiritual experience. The not-real ghosts seem to be everywhere too, but only for people that believe they exist or at least believe that they might exist. They rarely bother unbelievers. Ghost researchers call the not-real ghosts … residual ghosts. These ghosts seem to defy the Law of Conservation of Matter and Energy because they pop in and out of existence like virtual particles. The appearance of this type of ghost can be explained by quantum physics. From the Copenhagen Interpretation, which states that nothing is real until you look at it, to the holographic theory of the universe, all ghosts abide by the laws of quantum physics. People that experience residual ghosts say that they seem to be caught in a time-loop replaying the same scene over and over. The above-mentioned physics also apply to residual ghosts but with the addition of Schrodinger’s equations. For every “now” that we experience, a positive wave flows into the future and a negative wave flows into the past like concentric ripples created by a rock thrown into a pond. 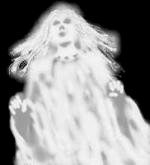 The fact that some people experience residual ghosts is due to normal functions of human consciousness. Although some might rather think of it as a “glitch.” Residual ghosts are unusual and fascinating experiences with natural causes. So, what’s the truth about ghosts? Do they exist? Yes, of course they do. Can the scientific method be used to investigate them? Yes, they use measurable amounts of energy. Can you record their voices and photograph ghosts? Yes, but one needs to be alert to pattern recognition tendencies.